For our latest teacher resource CD (available on request) we produced short videos to illustrate key points of Japanese American history. Teachers have been asking us for a summary video for ages, so we're glad to finally comply (with the help of funding from the National Park Service and 4Culture). We also posted the new videos to our YouTube channel, where you'll find excerpts of Densho's interviews with Nisei, who share their memories of working on family farms, discovering they were less American than they thought after Pearl Harbor, along with other up and down experiences during and after World War II. 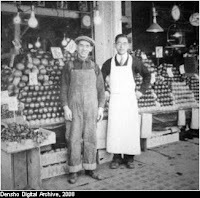 The first of five videos is on prewar Japanese American communities. The photos and voices are all from our Digital Archive, which teachers and other researchers can use free of charge. We hope educators will let their fellow teachers know about Densho's online curricula and huge bank of primary resources.